Stay just steps away from shopping, entertainment and the central station. Visit the island of Visingso, stroll in the city park and experience the lively Tandsticksomradet district. Close to golf courses and ski slopes. After a day packed with adventure, you can relax in our sky sauna. After a day packed with shopping and adventure, you can relax in our sky sauna with views of Jonkoping. If you would rather get some exercise, Nordic Wellness Atlantis SPA is next door, with direct access from our hotel. You can also pamper yourself with a spa treatment and unwind in its relaxing setting. Enjoy delicious dining at our partner restaurant Glädje. The restaurant is located next door with direct access from our hotel. 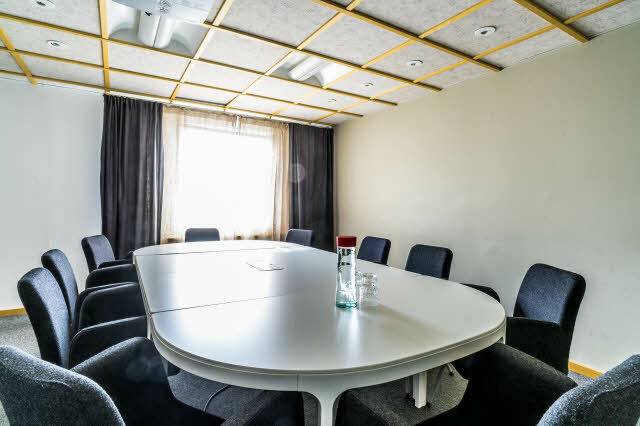 We offer various types of meeting facilities for conferences and meetings. WiFi is available throughout our hotel and if you'd like to explore the city yourself, why not borrow a bike from reception. We are also close to golf courses, as well as ski slopes for the winter months. Our hotel is centrally located, only a few minutes from shopping and popular sights. Take a trip to the island of Visingso or stroll in the city park with its magnificent view of the city. Don’t miss a visit to Tandsticksomradet with its museum, shops and gallery. It's located no more than a stone's throw from our hotel in the old part of town. When you stay with us, you are also close to golf courses and ski slopes. Relax for a while in our lobby bar. If you're hungry, Restaurant Glädje is right next door. We serve breakfast on the 4th floor.